The Lonar crater is the only known impact crater in the world to have formed on basalt rock. Thousands of stellar bodies and debris called asteroids and meteoroids pass within striking distance of Earth every day. They range from the size of dust particles to being kilometres-wide and weighing millions of tons. Each time our planet is struck by a sizeable extraterrestrial body, it leaves its mark in the form of an impact crater on Earth’s surface – and each one makes for a great story. The most famous is in the form of a theory that talks of a 10-km-wide asteroid that flew through space, seared through our atmosphere and struck the ground in Mexico’s Yucatán Peninsula 65 million years ago, forming the Chicxulub crater. This event is believed to have triggered the mass extinction of the dinosaurs. We’re are going to talk about a less famous impact crater that formed very recently (in terms of the geological time timescale). About 40,000 to 52,000 years ago, in what is today a small town in Buldhana district, Maharashtra, a massive meteor weighing more than a million tonnes struck Earth at a great speed, creating a one-of-a-kind impact crater 1.8 km wide and more than 150 m deep. For years, experts have been debating the origin of this special crater in the basalt rock of the Deccan Plateau. It was considered to be of volcanic origin, or a geobleme, which means ‘formed of terrestrial processes’. In the later half of the twentieth century, further studies and observation revealed its likeness to an extraterrestrial impact crater, and experts realised that it was an astrobleme, a crater of an extraterrestrial origins. Unmistakable signs such as the well-shaped circular circumference, the ratio of the depth to the crater’s diameter and, especially, the characteristic raised rim about 20 m above ground level on the outside of the impact radius proved that it was indeed an impact crater. Another important clue was the presence of fallen debris from the impact of the meteor with the ground, around the site of impact, making up what is called an ejecta blanket. The Lonar crater’s ejecta blanket ranges over one kilometre, including the rim of the crater. But what ultimately clinched the origins of the Lonar crater as being extraterrestrial was the discovery of shatter cones, breccia and maskelynite. Maskelynite is a type of glass that forms when the hypervelocity impact of a meteor or asteroid shocks the plagioclase, a rock-forming mineral, and causes it to vitrify. This is where it gets more interesting and special. The Lonar crater is the only known impact crater in the world to have formed on basalt rock. And the presence of certain rock minerals such as microbreccias and glass spherules in the crater draw close analogies to the geology and crater formations on the Moon. Essentially, Lonar has been able to give us insights into the lunar! What makes this story more exciting is what the crater basin encompasses today: a unique ecosystem that cannot be found anywhere else on the planet. 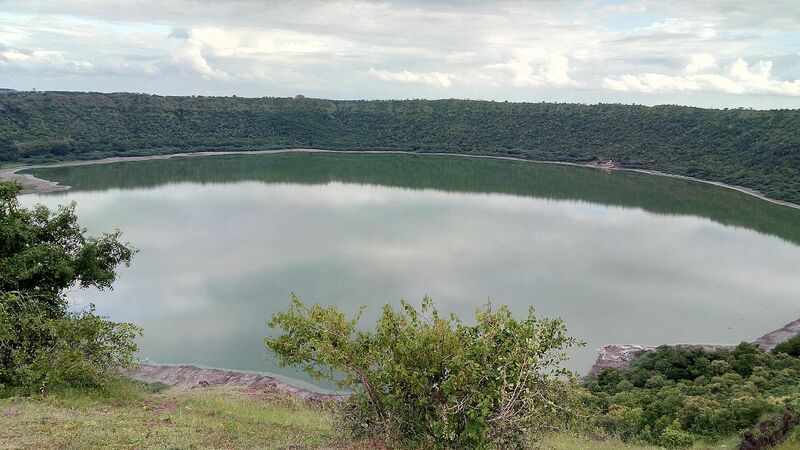 For starters, the Lonar crater is now a landlocked lake going about 140 m down below the rim. Small streams and freshwater springs on the shore feed this unusual bowl, whose water is both saline and alkaline. The alkalinity of the water increases towards the centre and harbours very rare forms of microbial life. The precincts of the crater thrum with biodiversity. Among the rich belt of plant life – which includes acacia, teak and tamarind trees – dwell varied terrestrial wildlife including monitor lizards, deers, bats, snakes and langurs. However, it may be the birdlife that steals the show. From waders such as shovellers, stilts, wagtails and ducks, to jungle specialists like crow pheasants, bee-eaters, woodpeckers, parakeets and peafowl, innumerable avian species abound around the crater. For history aficionados, the crater region had a special place in the culture and life of our ancestors, who built temples and shrines on the site but which today lie dilapidated and forgone. The magic of Lonar is that it is a mystical remnant of a celestial episode that took place thousands of years ago and unifies beautifully with earthly treasures. Who knows what other secrets remain to be found in the depths of this impact crater. This article was originally published by Sanctuary Asia and has been reproduced here with permission.